Get ready for adventure in Jaco, Puntarenas, Costa Rica. Jaco is near the beach and the rain forest, so if you love the outdoors, a Playa Jaco beach house may be the perfect fit for you. Learn more here! Listed below are other beach properties within a 50 mile radius of zip code 61101. Get ready for adventure in Jaco, Puntarenas, Costa Rica. Jaco is near the beach and the rain forest, so if you love the outdoors, a Playa Jaco beach house may be the perfect fit for you. Playa Jaco, or Jaco Beach, stretches 2.5 miles. The surfing here is great for beginners, and surfing schools along the beach offer classes to show you the ropes. And a Playa Jaco beach house can serve as a hub for more experienced surfers, as other beaches that appeal to more seasoned surfers are within easy distance. For example, Hermosa Beach, which has a beach break and hosts national surfing competitions, is just five minutes away from Playa Jaco beach houses. Two other nearby beaches, Playa Esterillos and Playa Bejuco, offer great surfing with a more local and relaxed atmosphere. In addition to surfing, Playa Jaco and surrounding beaches have equipment rentals for stand-up paddle boarding and other water sports, and there are a number of sport fishing tours you can book for an angling expedition. In other words, if there is something fun you like to do in the water, Playa Jaco beach houses are the place to be. Jaco is just south of Carara National Park, so there are many opportunities for outdoor exploration. The park has a dense rain forest that is home to a large population of wild scarlet macaws, which are a real treat to see in their natural habitat. The mountains and hills outside of Playa Jaco beach houses present the perfect terrain for ATV excursions. 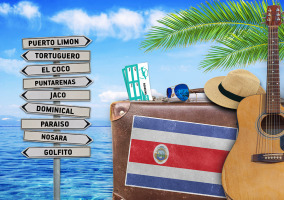 You can find guided tours and adventure parks that take you swimming in a waterfall, zip-lining, horseback riding, white water rafting, wildlife watching, or any other way you can think of to explore the incredible, lush scenery of Costa Rica. 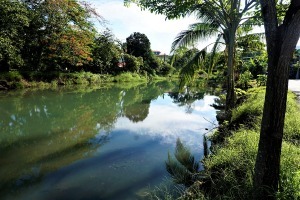 The best time of year to enjoy the outdoors in Jaco is in the dry season, from late December through early April. But even if you come in the wet season, you will still enjoy warm temperatures year-round, along with a lively nightlife. Beach bars and clubs near Playa Jaco beach houses give the nights at Playa Jaco a beach party vibe that is absolutely infectious.